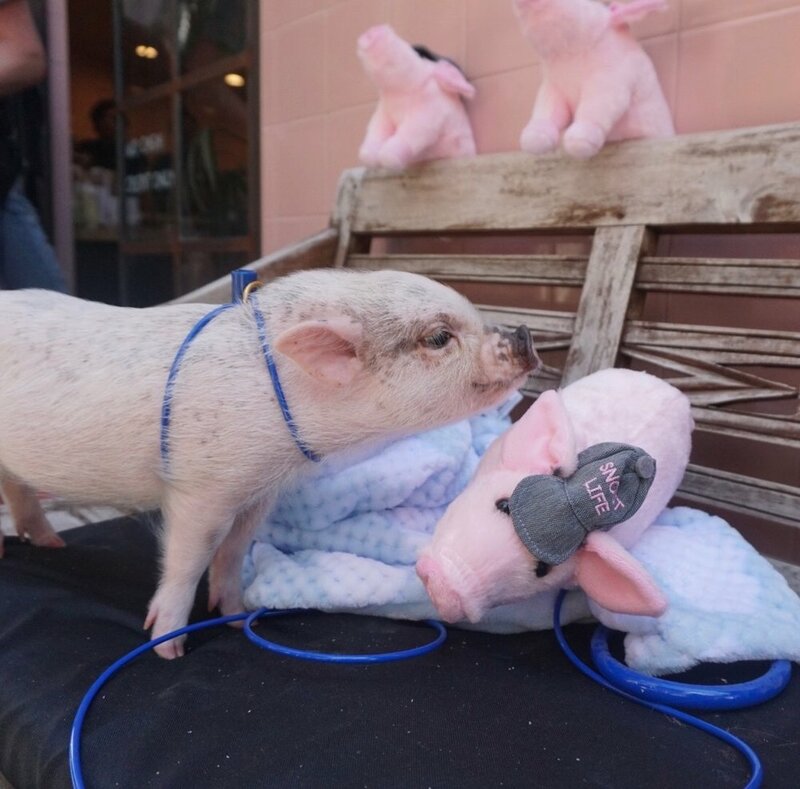 DIY Piggy costume for your pet! Here is an easy, peasy way to make your pet a piggy costume. Small dixie cup or any small cup. 1 large sheet of felt. 1. Cut a piece of pink felt a little longer than the pipe cleaner and wide enough that it can fold over the pipe cleaner. 2. Place the pipe cleaner inside, wrap and glue the felt around it. 3. Twist the tail in a curly pig shape. 4. Measure your pet's waist. Then, glue the tail to a piece of elastic that will fit around your pets’s waist. Now for that little piggy nose. 1. Cut the bottom of a small cup and wrap with a long piece of pink felt. 2. Trace bottom of cup on pink felt. Cut it out & hot glue it to the cup. Hole punch white felt or cut little circles of white felt & hot glue it on the nose. 3. Measure your pet's head and glue nose to the elastic. 1: Cut two large ear shapes. Step 2: Pinch and wrap around the elastic. Then secure with the hot glue. Now, your cutie is ready to OINK around! 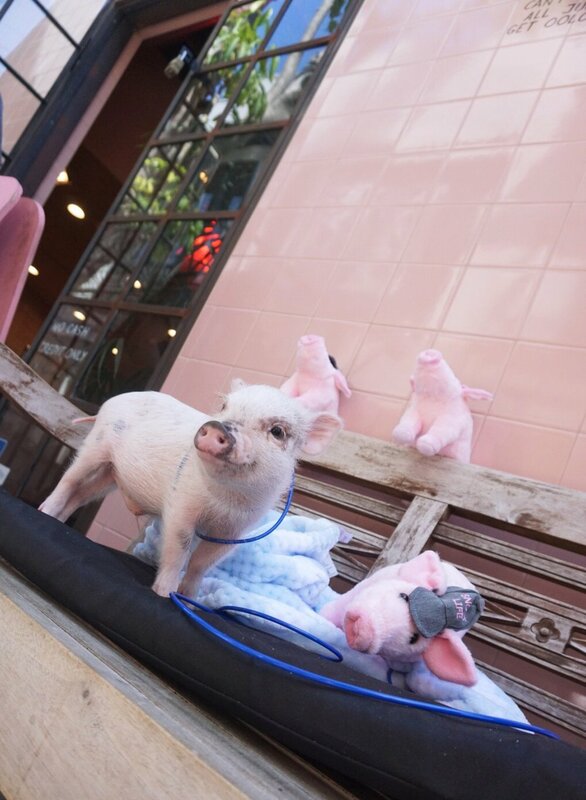 We would love to see your DIY Piggy Costume! #Hammyandme. As Hamlet grows, it has become harder and harder to find her clothes. Since pig clothes don't exist, I had to get a little creative. I know when I say "make" your head immediately goes to sewing. You will not need to be a master at sewing! Promise. Don't worry, I will teach you my ways. Muahahaha. Sorry, It was too easy. To be safe, measure the t-shirt and your pet directly before buying. Always give your pet a half an inch or more to make sure there is some wiggle room. If too tight, your pet can be uncomfortable. Now, take your supplies and follow the step by step video tutorial. We would love to see your DIY Pet shirts! #Hammyandme. 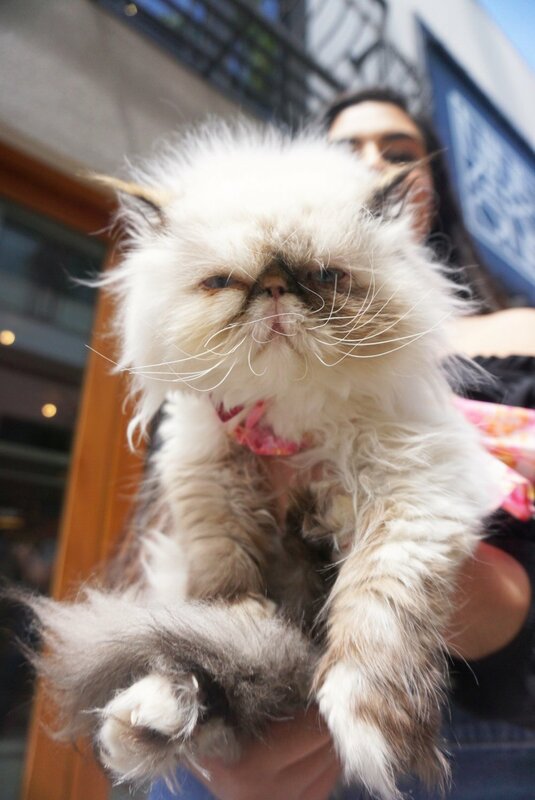 Watch the video below to experience a day in the life of Hamlet. Like children, Pigs are happier when they have a routine. Sunbathe, nap, snuggling with the human and grazing. Watch TV 1 hour to 2 hours. Sunbathe, nap, graze and snuggle with the human. Snuggle with the human and watch TV. Bedtime- usually around 8 PM. Hope you enjoy a day in the life of Hamlet. Please feel free to comment on the Youtube video for any questions. Like most of us these days, I started researching on the internet. I didn't find many reputable sources. I spoke with Hamlet's vet and he suggested the following organizations who have helpful information about pigs of all kinds. Below are 3 resource that have been my go to places for pig updates and helpful information on how to keep Hamlet healthy and happy. Here is a list of safe foods I have complied from the SCAMPP, The Best Friends Society and the American Pig Association. Please discuss food choices with your vet. Below is SCAMPP's List of Toxic plants. Foods with high amounts of salt and sugar. Vitamin C should only be given in moderation. It may cause bladder stones. Please feel free to email me at Melanie@hamletthepiggy.com for any additional questions or concerns. When I think of Memorial Day, I think food, family and fun. Why leave your little piggy or other fur baby left to beg for food. Try Hammy's red, white and blue popsicle. It's so simple a dog can do it (Pigs are the 5th smartest mammal :))! Feed your pig Hammy's Red, White and Blue popsicle. Watch your pig go to town on your delicious creation. #Hammyandme on instagram to show us your creations and for a chance to be featured on Hamlet's INSTAGRAM. Come on. You know the thought has crossed your mind. Should I get a pet pig?! Why, not? Especially a piglet!!! Their little snouts. Those little oinks. And that rambunctious personality. But, there is more to consider other than the cuteness. What will this pet pig need? Are prepared for your future pet pig to weigh up to 200 lbs? Adopt or buy a pig? What's their life span? 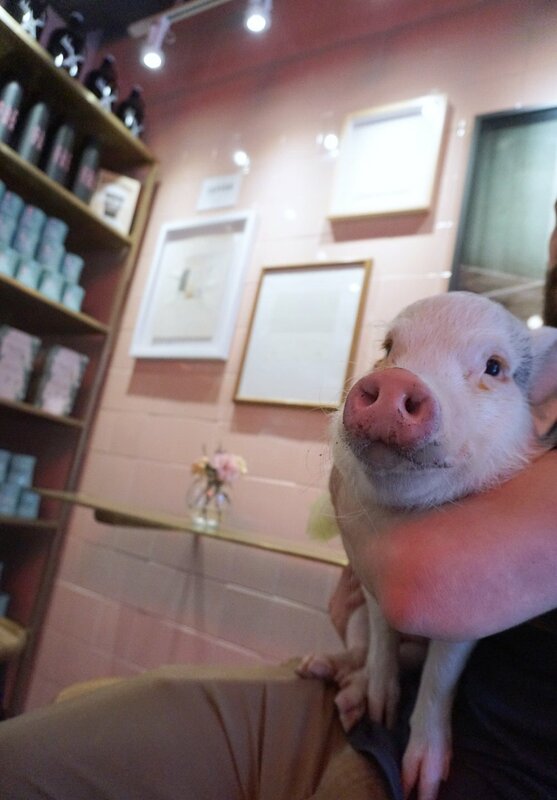 Does your pig need a city license? Where will you buy pig feed? How will you train and discipline your pig? What will your pig do when you're at work? Once considering these questions, a pet pig seems like a bigger responsibility than most think. Don't get me wrong, Hamlet has been the best pet I have ever had. She is sweet, sassy, mischievous, lovable and quite the snuggle monster. BUT when Hamlet first came into my life, I quickly realized this wasn't like having your average pet. Looking back, there was so much I had to learn. I wasn't even close to being prepared. I want to help you make a responsible and thoughtful decision before bring a pet pig home. Please take the time to consider these questions before bringing a pet pig in your home. These are only questions to give you an idea of the responsibility of a pet pig. The responsibility of owning a pig is not limited to these questions. What will this pet pig need? Here is an list of items I had prepared before Hamlet came home. Litter pan and horse bedding, pine pellet, or paper litter. I don't use pine litter because Hamlet tries to eat it. I recommend paper litter. You can find paper litter at any pet store. Clean indoor and outdoor area to call their own. Mini pig pellets. I reccomened Mazuri pig pellets (http://www.mazuri.com/minipig.aspx). Where will you buy pig feed? I buy Hamlet's pig pellets at a local farm feed store. I have also found that you can buy pig pellets online. Pig pellets are not always easy to find. I typically keep a month or two worth of food on hand at all times. Are you prepared for a pet pig that can grow to weigh up to 200 lbs? Wouldn't it be nice if a micro pigs existed?! Well, they don't. All micro pigs are potbellied pigs. These adorable creatures are considered and called "mini" because they are mini, domesticated versions of the 1,000 pound farm animals. According to the American Pig Association, "Healthy mini pigs average from 50-150 pounds. Some smaller bred mini pigs average 50-80 pounds." If a breeder tells you your "mini" pig will be smaller than that, they're lying to you and might be giving you advice to feed your pig too little. Adopt or buy a pet pig? Buying a pig is risky. You have no idea what kind of pig your going to get. Maybe you should ask yourself, Why do you want to buy a pig? Do you think it will guarantee you a "micro pig"? Or do you simply want a piglet? The average cost of buying a pig from a breeder is over $2,000. Did you know that thousands and thousands of owners are surrendering their pet pigs to shelters a year? Pigs of all ages and sizes. Unfortunately, animal shelters and rescues are unable to save all the pigs that are not adopted and these pig are euthanized. I guarantee that there is a pet pig in your area that needs a home. What is the life span of a pig? The average pig lives for 12 to 18 years. Do I need to have a pet pig license? 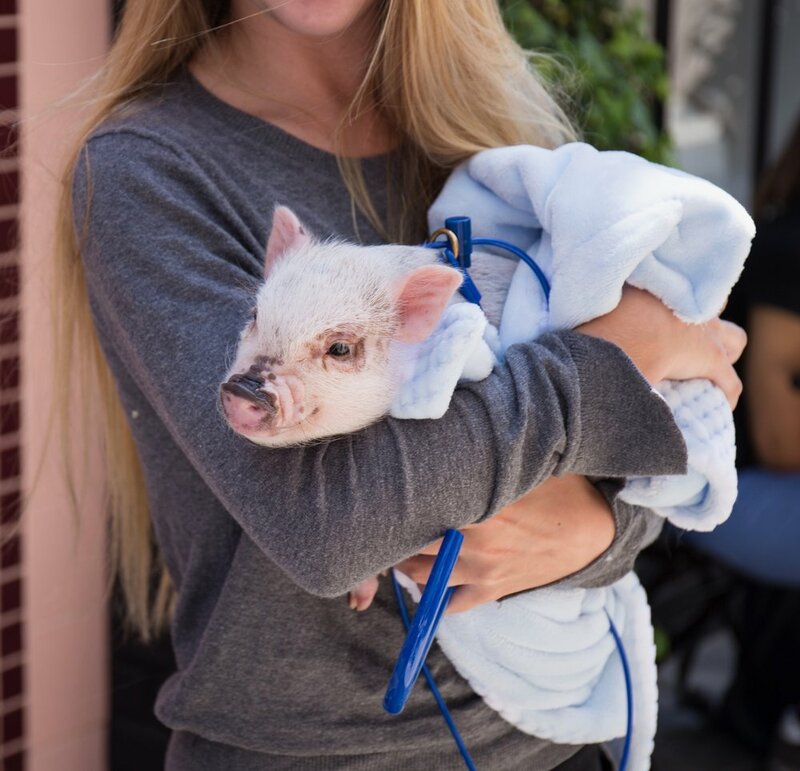 Most cities have regulations for owning a pet pig. The best way to find out if your city has regulation is to go to your city website or city hall. 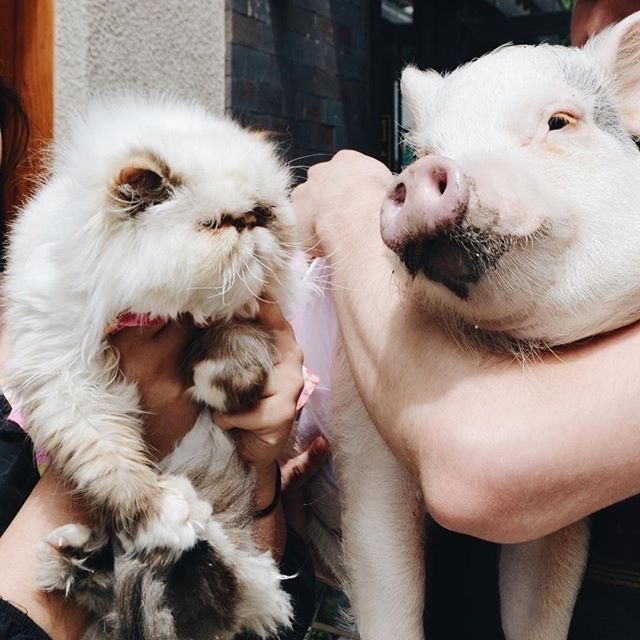 Most cities only allow pet pigs in certain city zoning areas. 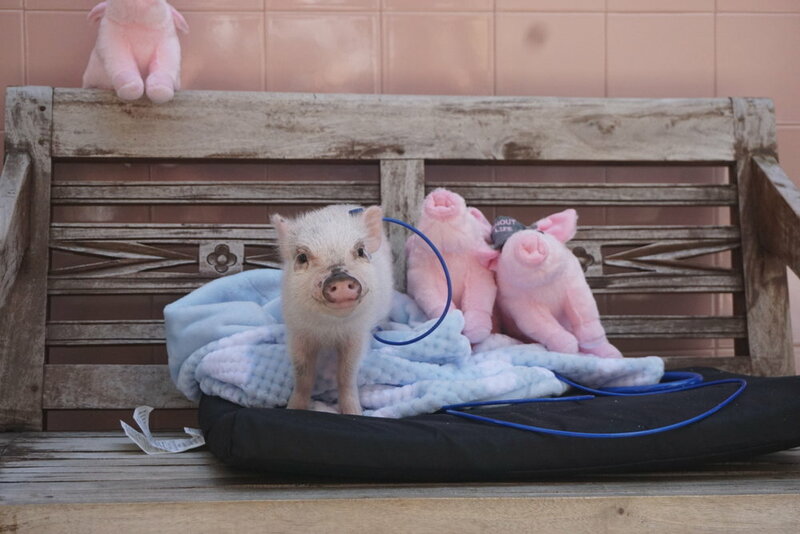 How will I train and discipline my pet pig? There are a lot of misconceptions about disciplining a pig. PIGS ARE NOT LIKE DOGS. You can not discipline your pig like a dog. Pigs are extremely sensitive and emotional creatures. They feel a vast amount of different emotions. I highly recommend, "Mini Pig Training Book: Tricks, Life Skills, and Communication with Your Mini Pig" by Kimberly L Chronister. What will your pig do while you are at work? Pigs need constant care and social attention. Pigs are also very intelligent and get bored. When a pig is bored they can become destructive. I DO NOT recommend getting a pet pig if you have a job that will force you to leave your pig inside for over 4 hours. Your pig will need plenty of time outside to sunbathe and graze. Your pig will also need time with you to attach and bond. I believe it is best if there is a family member who works part time, works from home or works close to home where they can visit their pig during the day. Be a responsible future pet pig owner and take these questions seriously before bring a pig home. Hamlet and all the other piggies out there thOink you. If there is a topic that I covered that you would like to know more about or maybe a topic you would like me to blog about, feel free to shoot me at email at Melanie@hamletthepiggy.com. New content relating to pigs can be found here weekly. Alfred Tea Meet and Greet! 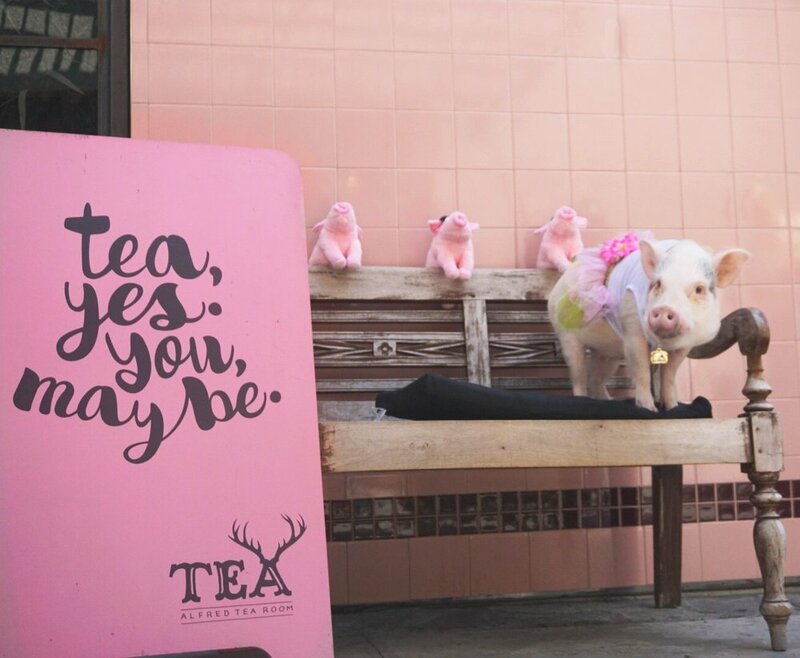 ThOink you so much to everyone who came out to meet me on Tuesday, April 18th at Alfred Tea in West Hollywood! It was so amazing meeting all of our new friends from near and far. We had so many incredible friends come! Some of our friends came all the way from San diego and some even skipped school! Talk about one cool Mom...;) There was even a cat in a dress and a 3 month old baby pig!! Have your heard?! You can now take me home!! I know... SQEAL! 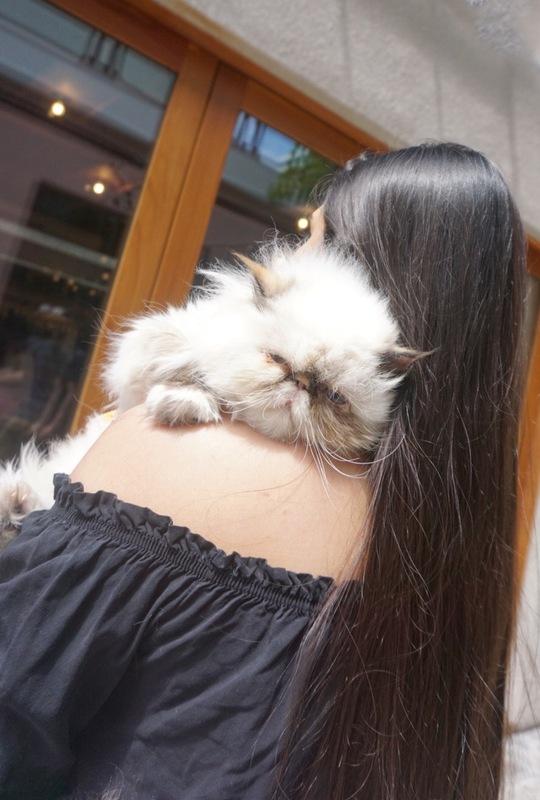 Now that we are going to be the bestest of friends, you have to make sure to tag me in all our insta-adventures.I cant wait to come home with you and go on some adventures. Be a friend and share all your adventures with your Hammy by Hashtaging your #AdventuresofHammy ! I will be reposting Hammy’s adventures with all her new besties every week! So be a friend and share those pics with me. ;) Don't hog them to yourself :) Oh and please get my good side. Hashtag your #AdventuresofHammy ! I will be reposting Hammy’s adventures with all her new besties every week! ThOinks for all your love and support.